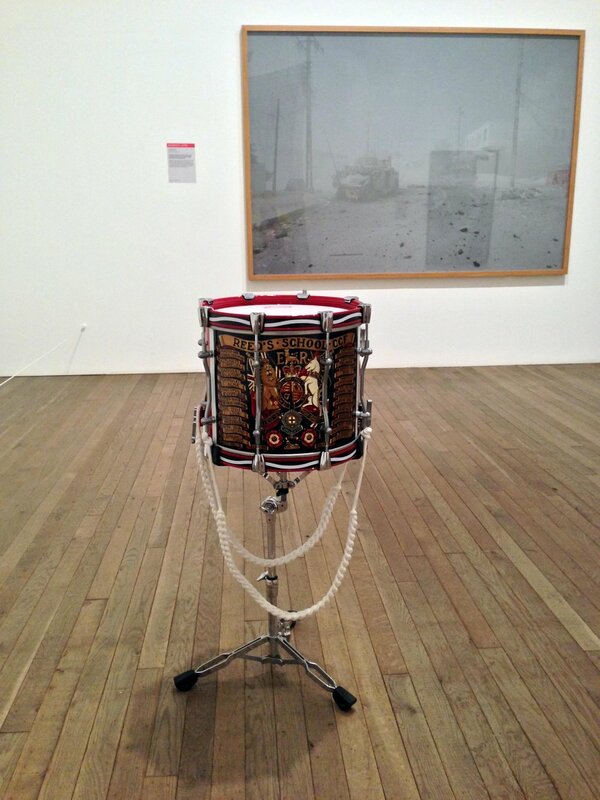 In January 2015 we choreographed a unique performance within the Conflict, Time, Photography exhibition at Tate Modern, London. Using Bertolt Brecht and Hanns Eisler’s unfinished opera War Primer as raw material, the performance saw a group of army cadets aged between 14 and 17 respond to specific photographic works in this landmark exhibition through procession, poetry and military drumming. On Monday evening, a crowd of around 150 people gathered at Tate’s exhibition “Conflict, Time, Photography” for Broomberg and Chanarin’s “One Way Song” performance. People wandered around the exhibition galleries; several noticed the nine drums placed in front of specific photographs. A small, hand-sewn booklet showed the photos that corresponded to the time frame and drum locations. Downstairs, the seminar room already had four cadets getting dressed. One hid the hole in his sock while another looked distressed at the sight of his imperfectly polished boots. He gave them a final polish before putting them on. Another’s jacket was too tight leaving him no neck while a scraggly boy floated uncomfortably in his jacket. The uniforms not yet fit for these young boys bodies. It felt like the backstage of a play or a school show. These were regular teenagers but the costumes they were putting on were not. The boys and girls present belonged to the Army Cadet Force, an organization they can join outside of school. From the third floor, you could hear the thumping of the marching up the stairs getting louder and louder as the steps grew closer. Lt. Peter Oweh led the group of eighteen anxious teenagers, his voice resounding clear. For most it was their first time playing in front of an audience, let alone a major public institution like the Tate. They marched in step towards the exit door of the exhibition. The entrance of the exhibition, where I was standing, had a few eager visitors stepping out to see where the commotion was coming from. It seems that a few felt the noise was coming down through the air vents. After each cadet was placed in front of his drum, the drumming started. It was booming. A little girl put her hands on her ears to muffle the sound. Only now did I fully understand the relevance of the earplugs handed out at the entrance. Lt. Peter Oweh loudly recited: “These are our children. Stunned and bloody-faced” from Bertolt Brecht’s quatrains from his book, War Primer. The cadets took turns to drum. Every two minutes, following a signal, without thinking they followed the process. Were they being sent to the battleground in the same mechanical way? Drumming originally started as a signal for command or to administer punishment. Here, the drumming was continuous. One drummer marched over and relieved another so that there would be no interruption. It stopped. In line, the cadets marched out. They came back out sweating, their arms aching but happy to have maintained their concentration throughout the drumming. A few of the cadet parents proudly snapped some photos. I watched attendees come out of the galleries, waiting to listen on their impressions and comments but they appeared at a loss for words. Many had visited the exhibition and had looked at the photographs of the conflicts of the recent past while perhaps being detached from them. Anti-capitalist, pacifist poems juxtaposed with Army Cadet Force children drumming, stone faced, left a powerful impact. This brought to mind all the children sent to battle in The Great War or the ones in Iraq, Sudan or any other part of the world today. The photographs are striking but being confronted with a live performance resonated differently. Throughout the exhibition we see the devastations of war on objects, people, landscapes, at the time as well as through recovery. 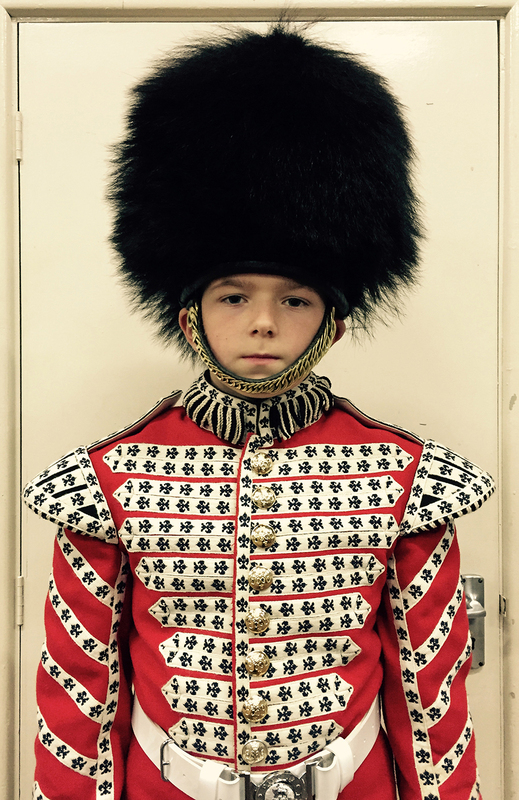 If the show is asking us to think of conflict past and present through a lens, the performance with the cadets gets to the heart of the matter. Ruins don’t just apply to buildings but to people as well. There are few portraits in the exhibition but looking back at a photograph of a Japanese woman’s scarred face next to one of these drummer boys rosy cheeks, it was striking a different chord. Here we stand in front of an uncorrupted young man or woman. We confront the legacy of war by looking at these awkward but determined teenagers. This project is an extension of their body of work, Rudiments.